Sadelstolpar There are 3 products. 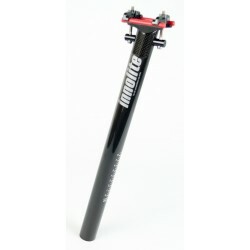 Ultralight seatpost made of carbon fiber with a robust saddle clamp construction. Available in sizes 27.2 (400 mm, weight 134 g), 30.9 (400 mm, weight 146 g) and 31.6 (420 mm, 156 g). Finish is UD under glossy clearcoat, logo in silver.